With its classy glass top, this plant stand gives a warm feel to any room. Its original black metal base provides sturdy support as well as an elegant look. Use this multi- functional table to place your favorite plant or decorative piece. With its classy glass top, this plant stand gives a warm feel to any room. Its original black metal base provides sturdy support as well as an elegant look. Use this multi- functional table to place your favorite plant or decorative piece. It will be a sure eye-catcher! 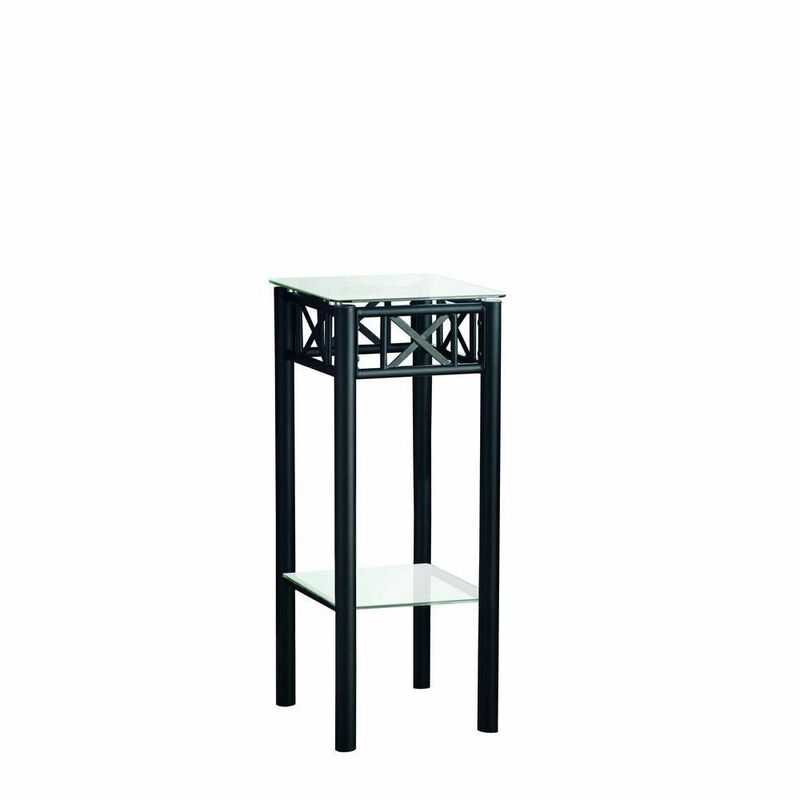 Accent Table - Black Metal With Tempered Glass With its classy glass top, this plant stand gives a warm feel to any room. Its original black metal base provides sturdy support as well as an elegant look. Use this multi- functional table to place your favorite plant or decorative piece. Accent Table - Black Metal With Tempered Glass is rated 4.2 out of 5 by 5. Rated 5 out of 5 by Marcella from A very good product, made of nice-looking materials, easy to... A very good product, made of nice-looking materials, easy to put together, and the finished assembly is exactly what I needed. Rated 3 out of 5 by Judy from This was a Christmas gift for my mom. Although she liked it and did not want me to return it, it... This was a Christmas gift for my mom. Although she liked it and did not want me to return it, it was not "square". The bottom glass piece did not fit square. When put together it was skewed or crooked, but my mom said this didn't bother her. Rated 4 out of 5 by amd from after we received all of the parts and my husband put it together we were happy! It's a plant stand. We will put a plant on it when we have to bring that plant in from outside. Rated 5 out of 5 by Anonymous from plant stand The stand is just what I was looking for and looks great in my family room.